The Fair Labor Standards Act’s overtime provisions constitute the most important family-friendly legislation ever enacted in the United States. They set the fundamental labor standard that work beyond 40 hours in a week must be compensated at a time-and-a-half premium, thereby discouraging overwork and protecting the right of workers to have time for themselves, to care for their families, and for civic participation. Section 7 of the Fair Labor Standards Act effectively created the five-day workweek with a two-day weekend, and preserving and enforcing its protections is part of the Department of Labor’s fundamental mission. This rulemaking is essential if the Department of Labor (DOL) is to fulfill its mission. The proposed rule will restore or strengthen overtime protections for 13 to 15 million salaried workers, protections that have been eroded by decades of bureaucratic hostility and neglect. The Economic Policy Institute commends Secretary Perez and Wage and Hour Administrator Weil for their leadership. 1. The proposed rule serves the purposes of the Fair Labor Standards Act overtime provisions and the EAP exemption. a. As the Notice of Proposed Rulemaking (NPRM) spells out, the judicially recognized purposes of the FLSA overtime provisions are to spread work, to prevent “the evil of overwork,” and to compensate employees for the burden of overwork. The benefit to the economy of spreading work is obvious: if, for example, three salaried insurance adjusters each work 40 hours a week, the buying power of the workforce is greater, and the costs of unemployment insurance and social welfare programs are less, than if two work 60 hours a week and the third is unemployed. 2. The salary threshold for EAP exemption is far too low and must be increased. b. Unfortunately, through a combination of political and bureaucratic negligence and hostility to the purposes of the act, the salary threshold has lost more than half its inflation-adjusted value since 1975. The $250 per week salary threshold for EAP exemption set by the Ford administration in 1975 would be $1,000 per week today, adjusted fully for inflation over the last 40 years. The 2004 increase, the only adjustment since 1975, was so minimal that 11 years of mild inflation have been enough to reduce its value to less than the poverty line for a family of four. Plainly, a poverty level salary is not an executive, administrative, or professional salary and thus this salary threshold fails to carry out the statutory purpose of distinguishing bona fide exempt employees from employees whose status and responsibilities are insufficient to qualify them for exemption. 3. There is no single acceptable methodology for setting the threshold. a. Congress left the definition of EAP to the Secretary; that definition has always included a minimum salary level for exemption. b. The Secretary has used a variety of reasonable methodologies over the years. The original salary tests in 1938 were modeled on the National Recovery Codes of Fair Competition under the National Industrial Recovery Act, rather than on a survey of exempt workers’ salaries. The Stein Report in 1940 examined a variety of sources, including the salaries paid to professional employees in the federal government; the relative pay of bookkeepers, accountants, and auditors; the probable percentage of stenographers who would be exempted; and the federal government’s classification of “the so-called clerical, administrative, and fiscal group of Government employees.”8 The 1949 report and recommendations were based in large part on survey information “obtained as a by-product of the Divisions’ regular investigative programs.” In 1958, the department’s Wage and Hour Division set the salary thresholds at a level designed to deny the exemption to 10 percent of the employees found in its investigations to be exempt as EAP in the lowest-wage region, the lowest-wage industry, the smallest cities, or the smallest establishments. In 1975, the 1970 salary determinations were adjusted for most of the inflation that had occurred in the previous five years. None of these various methods was ever overturned in court. c. The goal is to set the salary level high enough to exclude employees in nonexempt occupations but low enough to avoid excluding bona fide EAPs. 4. The 40th percentile salary (estimated $50,440 in 2016) is within the historical norms for the threshold and cannot be said to be unreasonable. a. In relation to the median wage, the minimum wage, and the college-educated entry-level wage, the threshold is appropriate. i. To be commensurate with the status and prestige expected of exempt managers and executives, the salary level should be well above the median wage, the wage paid to the “typical” employee. When the Ford administration raised the salary threshold in 1975, it was 1.57 times the median wage. The median wage in 2013 was $16.70 per hour. Were we to update the threshold using that same ratio—1.57 times the median wage—the threshold would be $26.22 an hour, around $1,050 on a weekly basis and $54,536 on an annual basis, suggesting that DOL’s proposed $970 weekly threshold (in 2016 dollars) is on the low side. ii. In 1975, the short test salary level9 was approximately 3 times the minimum wage, very close to the ratio of DOL’s proposed level to the current $7.25 minimum wage, which is 3.36-to-1. b. The 1960s and 1970s levels adjusted for inflation would yield a higher figure than DOL proposes. i. In 2013 dollars, the 1963 salary threshold was $998, the 1970 threshold was $1.071, and the 1975 threshold was $984—all higher than the $50,440 threshold DOL proposes for 2016.
c. Taking into account wage growth and especially growth in executive pay, the threshold should be higher, not lower, than the 1960s’ and 1970s’ thresholds. 5. An examination of occupations shows that the salary level properly excludes historically nonexempt occupations from exemption while allowing exemption of most employees in historically exempt occupations. b. The National Compensation Survey suggests $970 per week is an appropriate dividing line between exempt and nonexempt salaried workers. i. BLS publishes data (most recently from 2010) of supervisory workers by management occupation and median weekly earnings. For management occupations, the BLS breaks out four levels of supervisory responsibilities, and the median weekly earnings range from $1,385 to $3,427.15 Thus, by this metric, a $970 threshold is well below a level associated with supervisory, and presumably exempt, duties. ii. Looking at the full list of median earnings for supervisory jobs in management, only “team leaders” who were preschool education administrators, food service managers, property managers, and “first line” lodging managers earned below this threshold (and note that for some of these occupations, the mean, as opposed to median, earnings were above $970 per week). iii. BLS grading of occupations by leveling factors (scores given to each occupation based on its demands for skills, knowledge, and responsibilities) find the hourly wage of about $24 ($970/40) to be consistently below level 7 (out of 15), also consistent with nonsupervisory responsibilities. 6. Critics of the proposed rule wrongly assert that it is deficient because it fails to account for regional salary differences. The FLSA does not require a multiplicity of regional salary thresholds for the EAP exemption any more than it does for the minimum wage, and DOL has always set national salary levels under Part 541. In any event, regional wage and salary variations are much less significant than they were in the past. The concern that establishing a national salary threshold imposes hardships on lower-wage states is always raised about any national standard, be it the minimum wage or earlier salary thresholds. 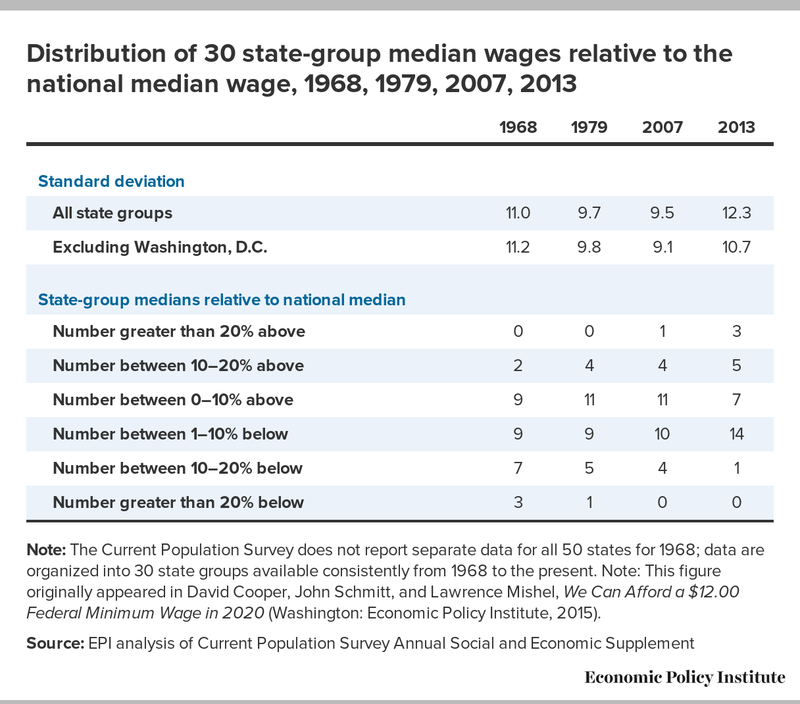 There should be far less concern about the impact of regional wage disparities now than in the past, however, because these disparities have shrunk markedly over the last four decades as wages across states have converged toward the national average or median; this is especially true in the bottom of the wage scale as lower-wage states have moved much closer to national norms. Recent research by the Economic Policy Institute demonstrates that the wage distributions across the U.S. states are closer together now than they were four or five decades ago. This means that the salary threshold that divides EAP workers from other workers in lower-wage states is much closer to the national norm today than it was when prior levels of the threshold were established, such as in 1975. This should allay concerns that a higher national salary threshold would not fit the employment conditions in lower-wage states. Apprehensions about national standards are often motivated by the potential impact on lower-wage states in the South. Figure A displays the median hourly wage in the nine Census divisions, in 1968, 1979, 2007, and 2013. Of particular interest are the three Southern divisions (South Atlantic, East South Central, and West South Central), where state median wages have historically been lower than in other parts of the country. 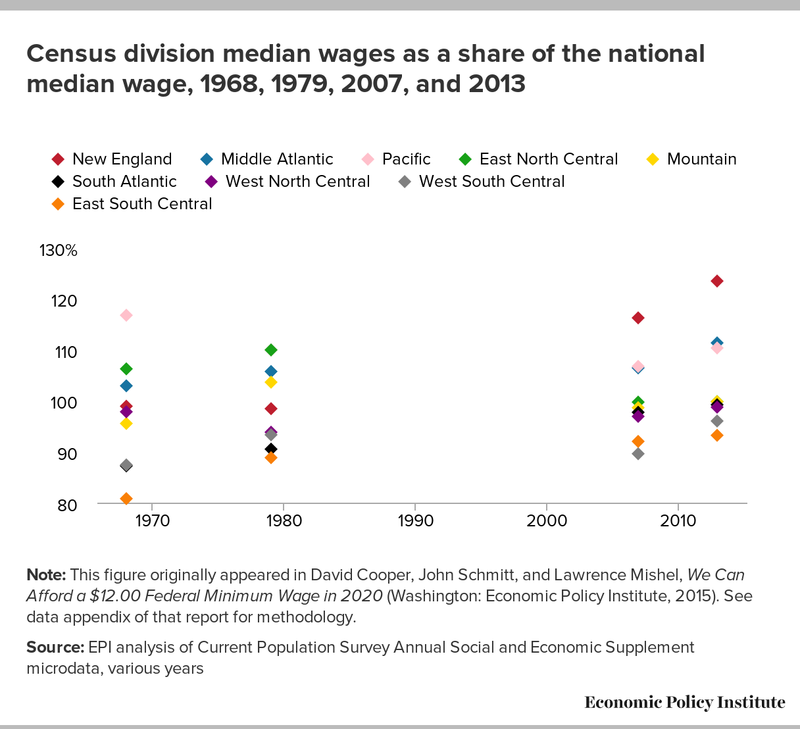 The data at the Census division level show a clear tendency toward compression between 1968 and 2013, with the ratio of the median wage in these three divisions moving from a range of 81–87 percent of the national median wage in 1968 to a range of 93–99 percent of the national median in 2013. That is, there is no Southern division (South Atlantic, East South Central, or West South Central) which has median wages more than seven percent below the national median, which means that the South’s wages have strongly converged toward the national norm. These data demonstrate that any national wage standard such as the salary threshold will have less relative impact on southern states than was the case in 1968 or 1975. Note: This figure originally appeared in David Cooper, John Schmitt, and Lawrence Mishel, We Can Afford a $12.00 Federal Minimum Wage in 2020 (Washington: Economic Policy Institute, 2015). See data appendix of that report for methodology. Note: The CPS does not report separate data for all 50 states for 1968; data are organized into 30 state groups available consistently from 1968 to the present. The District of Columbia is excluded from this figure. 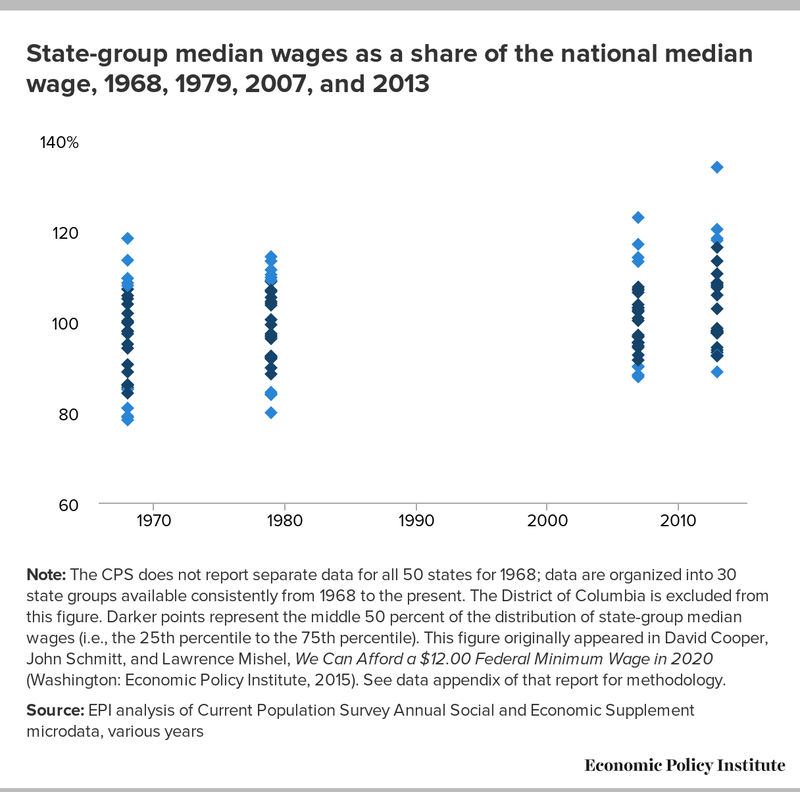 Darker points represent the middle 50 percent of the distribution of state-group median wages (i.e., the 25th percentile to the 75th percentile). This figure originally appeared in David Cooper, John Schmitt, and Lawrence Mishel, We Can Afford a $12.00 Federal Minimum Wage in 2020 (Washington: Economic Policy Institute, 2015). See data appendix of that report for methodology. As Table 1 demonstrates, in 1968, three of the 30 state groups had a median more than 20 percent below the national median, and seven of the 30 had medians between 10 and 20 percent below the national median. By 2013, no state group was more than 20 percent below the national median, and only one state group (Oklahoma and Arkansas) was more than 10 percent below the national median. In that same year, two-thirds of the state groups (21) were within 10 percent of the national median, up from 18 in 1968—and eight were more than 10 percent above the national median, up from just two in 1968. Note: The Current Population Survey does not report separate data for all 50 states for 1968; data are organized into 30 state groups available consistently from 1968 to the present. Note: This figure originally appeared in David Cooper, John Schmitt, and Lawrence Mishel, We Can Afford a $12.00 Federal Minimum Wage in 2020 (Washington: Economic Policy Institute, 2015). The analysis of wage convergence across states to this point has been addressed using median hourly wages. Given that the salary threshold affects workers with higher salaries and more education, it is useful to confirm these findings using data on the median hourly wage of college graduates (all college graduates, including those with advanced degrees). 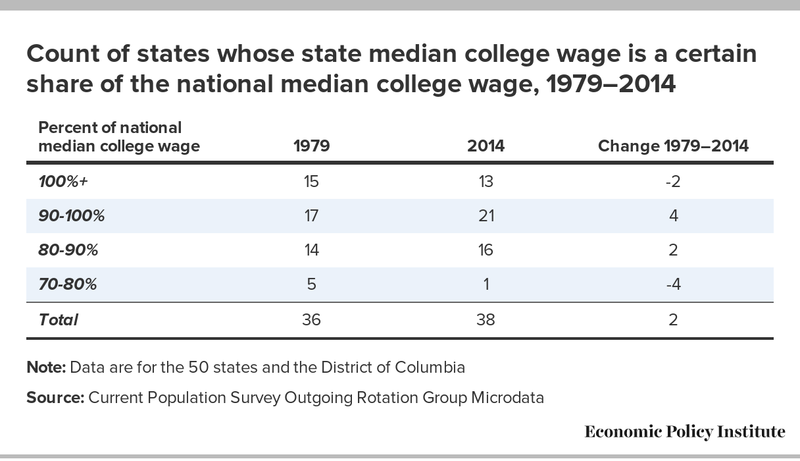 As was seen with median wages, there has been a strong convergence of college wages across states. Table 2 shows that while in 1979 there were five states whose median college wage was at least twenty percent below the national median college wage (i.e., in the 70–80 percent category), by 2014 there was only one state (South Dakota at 78.2 percent). In 2014 there were 13 states with higher than national college median wages and another 21 which had wages within 10 percent of the national norm. These data indicate that college median wages have converged across states as did median wages of all workers. This provides further comfort that national standards for salaried workers are less potentially burdensome on lower-wage states than in earlier times, such as 1975, when the salaried threshold was reset. When measuring the reasonableness of the proposed level today, it is also important to note that the department’s past efforts to set the exemption did explicitly take into account the tendency of wages and salaries to be lower in the South than the national average. In 1958, for example, the department set the long-test thresholds at the level below which fell only 10 percent of exempt employees in each exemption category in the South. The short-test level, equivalent to the current standard test, was set at $125 per week to maintain its previous relationship to the long-test levels. According to the July 23, 2015, congressional testimony of the U.S. Chamber of Commerce, the inflation-adjusted value of that salary level today is $53,485.64, and the $200 short-test level set in 1970 would be $63,741.60 today. In effect, the department has “baked in” its earlier adjustments to account for the South, arguably to a much greater extent than is called for today, when regional differences are much less than they were 50 years ago. 7. The Chamber of Commerce’s argument that Congress disfavors automatic adjustment of the salary-level test is both wrong and legally irrelevant. It is irrelevant because Congress in 1938 gave the authority to define and delimit the terms “bona fide executive, administrative, or professional” to the Secretary of Labor and has never taken it back, except with respect to very particular occupations, such as teachers and computer professionals. Those changes only strengthen the clear legal authority of the Secretary to say at what salary level an employee qualifies as EAP or how to change it, as the statute commands, “from time to time.” In her Congressional testimony on behalf of the Chamber of Commerce, former Wage and Hour Administrator Tammy McCutchen nevertheless argued that “in 1996, when amending the FLSA to add the Section 13(a)(17) exemption for computer employees, Congress set the minimum hourly wage for exemption at $77.63 [sic] (6 1/2 times the 1990 minimum wage) without providing for automatic increases of that amount. Thus, it seems unlikely that Congress intended the DOL to impose automatic annual increases for the salary-based exemption from the FLSA’s minimum wage and overtime requirements.”19 McCutchen failed to mention that a different Congress in 1990 did set the earnings test for the exemption of professional computer employees to rise automatically with increases in the minimum wage. The 1996 Congress amended section 13(a)(17) to remove the automatic adjustment. But what Congress said about that subsection of the act in 1996 is irrelevant to whether the Congress in 1938 or at any time thereafter limited the power of the Department of Labor to use an automatic adjustment mechanism to define and delimit the EAP exemption. Congress has had 77 years to add such a restriction to the law if it chose to do so. It has not, though it knows how to do so, as shown by the 1990 and 1996 amendments to section 13(a)(17). 8. Indexing the salary level is appropriate. The department’s reasoning is sound. Any fixed nominal salary threshold will be automatically and increasingly outdated with each passing year as both salaries and inflation continue to rise. The history of updates indicates that the current process—the threshold has been updated only seven times in 78 years—is ineffective in maintaining an appropriate salary threshold that reflects actual EAP compensation. Indexing the threshold in a transparent, predictable way will provide certainty and maintain the effectiveness of the salary threshold in advancing the act’s purposes. The only substantive issue is whether the threshold should be indexed to wage growth or price growth, as raised by the Department of Labor. The appropriate metric for updating the salary threshold is a wage metric. A simple inflation adjustment is inappropriate for several reasons. First, prices can sometimes decline, as they did in 2009. This can happen because some items have very volatile prices, with energy costs being the leading example of an item whose price can rapidly escalate or decline. Second, wages can be expected to grow over time and to grow faster than prices. The salary distribution of salaried workers will therefore tend to shift upward every year. The reason for a wage metric is simple. The salary threshold acts as a bright line between likely EAP-exempt employees and those requiring overtime protections. Given the continuous growth of salaries, that salary line will need to move. By reference to the history of the threshold level, as discussed above, the 40th percentile is an apt bright line to divide the potentially exempt from the certainly nonexempt. It follows that the salary growth at the 40th percentile appropriately updates that line, capturing the earnings improvements at that line. The simple logic is that a salary threshold requires a salary update. b. Is reclassification a problem? Some analysts have argued that the establishment of a new salary threshold will lead to a massive reclassification of salaried employees to be hourly employees. This would involve converting current salaried workers to hourly workers at a much lower rate of pay (i.e., compared with the imputed hourly rate of the former weekly salary assuming 40 hours worked). Such a scenario would, in this view, leave the workers with the same actual weekly earnings once overtime is paid even though they are paid a lower straight-time rate. The problem with this scenario is that it assumes a market economy which is only one-sided, where employers have all the power to set the terms of exchange and employees have no other choice but to accept the employer’s terms. This is never fully the case and will certainly not be the circumstances under which this new threshold will be implemented in the next two years. The employment landscape will be shifting as the economy moves toward full employment, a marker some analysts think we are currently near, and which even less-optimistic analysts consider we will be approaching in the next two years or so. The unemployment rate in July 2015 for college graduates was just 2.6 percent and for “Management, professional, and related” occupations, 3.1 percent.20 These unemployment rates will be dropping over the next two years and, correspondingly, we can expect the quit rates of salaried workers to increase as employers compete more intensively for quality personnel. This is not an environment where employer choice fully dominates. A consistent finding of both labor and macroeconomics is that nominal wages are “sticky,” meaning that employers rarely will lower them (when employers want to cut wages of incumbent workers, they allow inflation to erode their real value). Thus, there will be extensive pushback to any attempt to lower an incumbent employee’s hourly rate of pay. People are sensitive to what their rates are and can compare them with both their own rates in the past as well as others’ rates, explicitly or implicitly. They will not be happy having their rates lowered and becoming the equals of other employees who have earned far less than they did in the past. The setting of the threshold will also establish a clearly observable new norm in the workplace by setting a salary threshold under which employees will expect to earn overtime for extra work. It will be obvious to employees that any reclassification will be done to disadvantage them. These new norms in the workplace will limit employer ability to reshape the salary/wage structure to allow for lower hourly wages in order to accommodate continued extensive hours beyond 40. For these reasons and others it can be expected that employer ability to reconfigure pay rates will have clear limits. Perhaps this shift to fewer salaried workers with overtime protections and to hourly workers at lower pay rates but working substantial overtime hours could occur over time along with staff turnover. If so, this would be a very slow and unsure process. Such a shift would require that the employer make clear to potential new hires that they are receiving very low hourly rates because they are expected to work many overtime hours. That may not be an attractive package to offer potential new hires who will compare the hourly rates they are offered to other jobs. 9. The overtime regulation’s duties test should be clarified, simplified, and returned to the original concepts expressed in the department’s earliest rulemakings. Concepts enunciated in the earliest rulemakings reflect the time when congressional intent was fresh in the minds of department officials who had recently helped draft the FLSA. Those concepts included drastic limitations on the performance of nonexempt work by exempt employees. Originally, the regulations provided that exempt employees could perform no significant amount of nonexempt work, which was expanded to a maximum of 20 percent in 1940. These limits continued to expand over the years and were, unfortunately, abandoned altogether by the Labor Department in 2004. They should be reestablished with a rule that no exempt employee can perform nonexempt tasks during more than half of her work hours during the workweek. The idea that an employee who spends all or even most of her time sweeping floors, running a cash register, serving coffee, stocking shelves, unloading trucks, or performing any other nonexempt work could be an executive with no right to overtime pay is absurd and runs contrary to the act’s intent that only bona fide executives should be exempt. The only limitation Congress has imposed on the department’s authority to narrow the EAP exemption based on an employee’s performance of nonexempt work is found in an exception that applies only to retail and service establishments: “an employee of a retail or service establishment shall not be excluded from the definition of an employee employed in a bona fide executive or administrative capacity because of the number of hours in his workweek which he devotes to activities not directly or closely related to the performance of executive or administrative activities, if less than 40 per centum of his hours worked in such workweek are devoted to such activities.” 29 USC 13(a)(1). Even with respect to retail and service establishments, therefore, DOL is clearly authorized to limit the EAP exemption to employees who devote no more than 40 percent of the hours in their workweek to nonexempt activities. 10. DOL underestimates how many employees would have their rights changed by the new threshold. 11. DOL underestimates how many jobs will be created as employers adjust to the new rules. The department underestimates job creation from the new rules because it underestimates how many of the 15 million affected employees earning salaries between $455 and $970 per week are currently being treated as exempt. The National Retail Federation (NRF) provides a clearer understanding of just how few of the affected employees are currently considered nonexempt and entitled to overtime pay by their employers. The NRF, operating on assumptions about the law that are widespread in industry, estimates that more than two million exempt employees in its sector (64 percent of all exempt employees in its sector) will have their right to overtime pay changed by the rule. Appendix C of the NRF report, Rethinking Overtime Pay, lists the top 15 retail occupations by number of currently exempt employees and estimates both the total number of employees and the number of currently exempt employees.23 Measured against DOL’s probability estimates, NRF identifies more than 1.1 million employees as currently exempt who are not. Because DOL does not consider these employees to be currently exempt, none of them are included in its estimates of employees whose rights will change when the threshold increases. The retail and restaurant sector employs less than 20 percent of the U.S. workforce. 12. Nonprofit, charitable, and human service organizations will not be greatly affected by the rule. Opponents of the proposed rule have made a number of questionable claims, but one claim in particular—that nonprofit organizations providing services to the poor and the disadvantaged will see a crippling increase in personnel costs—is demonstrably false because FLSA coverage does not extend to most nonprofit employees or employers. Unless coverage is established for the employer or employees, the protections of the FLSA, including the proposed overtime rule changes, simply do not apply. Coverage is determined in one of two ways. First, employers who are engaged in business that generates annual business or sales revenues of at least $500,000 per year are covered by the FLSA and must pay the minimum wage and overtime, unless another of the many exemptions in the law applies. The key criterion for this provision is business or sales revenue. Most nonprofits, including, for example, charitable organizations providing free meals to the hungry and nonprofits providing addiction or mental health services, are not engaged in business. They provide charitable services and their employees, therefore, are not typically covered by the FLSA. The second way the FLSA could extend to employees of nonprofits is if employees’ work regularly involves them in commerce between states (“interstate commerce”)—individual workers who are “engaged in commerce or in the production of goods for commerce.” Employees covered as individuals include those who produce goods (such as a worker assembling components in a factory or a secretary in an office typing letters that will be sent out of state), regularly make telephone calls to persons located in other states, handle records of interstate transactions, travel to other states on their jobs, or do janitorial work in buildings where goods are produced for shipment outside the state. But again, the key is that the employee is engaged in commerce between the states. Most nonprofit organizations do not typically engage in this activity and if they do, can manage this interstate commerce activity so only a few employees are affected. There are nonprofits that, in addition to their core charitable activities, also manage revenue-producing activities that may bring that part of the organization, but only that part, within the scope of the FLSA. An example could be a prisoner reentry program that as one of its employment strategies builds and sells office furniture to businesses. If this side business produces revenues of at least $500,000 annually, or if its employees are involved in interstate commerce as described above, those employees engaged in that covered commercial business or those employees engaged in interstate commerce are entitled to the protections of the FLSA, including the proposed overtime changes. But that is only fair—if a nonprofit is also competing with for-profit businesses it should be held to the same employment standards as the for-profit businesses. Leveling the playing field among employers was and remains a major policy objective of the FLSA, and requiring nonprofits that compete with commercial enterprises to comply with the same employment standard serves that policy goal. The overtime changes in the NPRM are not burdensome for any employer. But they will have very little impact on organizations providing charitable services.24 A nonprofit organization, unless it is also engaged in commercial activities, will not be deemed a covered enterprise, and only those individual employees engaged in interstate commerce will be covered. Most nonprofits and their employees will not be covered by the FLSA and, consequently, not affected by the proposed overtime change. 13. Workers will not lose privileges and flexibility. Using the General Social Survey as his database, Golden examined the relationship between being paid on a salary basis or an hourly basis at different levels of income and the outcomes for employees in terms of work-family conflict, work stress, and options for flexibility such as being able to vary one’s workday starting and ending times, taking time off during the workday to attend to family matters, and being able to refuse employer requests for overtime work. Hourly workers paid at least $22,500 but less than $50,000 are less able than salaried employees to adjust their starting and ending times, but the differences, while not trivial, are not large enough to constitute a serious loss of flexibility among such workers. The share of salaried workers who report that they are “sometimes” or “often” able to change their starting and quitting times was 43–44 percent for hourly employees paid between $22,500 and $49,999; for salaried workers the share was 53–55 percent. There is therefore little danger that effectively “converting” salaried workers paid up to $50,000 to hourly status by raising the overtime pay threshold to $50,000 would markedly reduce their work scheduling flexibility. Generally it is the salaried workers much higher up the pay distribution who have a lot more flexibility to vary their start and end times and these workers will not be affected by an increase of the OT pay threshold to the modest levels discussed here. Above $60,000, 80 percent of salaried workers have this flexibility. Contrary to a common assumption, salaried workers at the affected pay levels appear to have no more ability to take time off for personal or family matters than do hourly workers at the same annual earnings levels. Only 34 percent of salaried workers earning $40,000–$49,999 report that it is “not at all hard” to take time off during the workday to take care of personal or family matters, whereas 41 percent of hourly workers at the same earnings level say it is not at all hard. Thus, effectively “switching” employees from salaried to hourly by requiring employers to track their hours for purposes of overtime pay would not reduce, and might even increase, this important element of work flexibility. Because the salaried workforce starts out with higher work-family conflict, a de facto reclassification as hourly might slightly reduce their work-family conflict. 9. The short tests refer to duties tests as revised in 1949 to include “special proviso[s] for high salaried” executive, administrative and professional employees. 11. Tammy D. McCutchen, “Statement of the U.S. Chamber of Commerce on Examining the Costs and Consequences of the Administration’s Overtime Proposal to the House Education and Workforce Committee’s Subcommittee on Workforce Protections,” July 23, 2015. 16. This excludes the outlier of Washington, D.C., which is also excluded from Figure B. 23. Oxford Economics, Rethinking Overtime: How Increasing Overtime Exemption Thresholds Will Affect the Retail and Restaurant Industries. (Washington: National Retail Federation, 2015); Note the NRF commissioned study was written before DOL issued the NPRM, hence the NRF’s use of a $984 threshold in its report. NRF published a short, partial update using $970, but not to Appendix C.
24. Certain organizations that may be a nonprofit are covered by the FLSA by operation of law. These include federal, state, or local government agencies; hospitals (establishments primarily engaged in offering medical and surgical services to patients who generally remain in the establishment overnight, several days, or for extended periods); residential care facilities primarily engaged (50 percent or more of income attributable to) in the care of the sick, the aged, the mentally ill, or developmentally disabled who live on the premises; and preschools, elementary and secondary schools (as determined under state law), and colleges.